EDITOR’S NOTE: As the PP Blog was preparing this story for publication today, Michael Crane was charged with a third murder. The victim, Bruce Gaudet, was found in a burning home Jan. 26, four days before the fire at the home of Lawrence and Glenna Shapiro. The story of the Shapiro homicides and Crane’s first court appearance in their deaths is below . . .
Lawrence Shapiro, 79, and Glenna Shapiro, 78, were found murdered late last month in Arizona. Lawrence was a physician, his wife of more than 50 years an educator. For nearly 30 years, she was the leader of what became the Arizona branch of the National Kidney Foundation. The PP Blog encourages its audience to visit this remarkable Blog, an homage to the remarkable lives of the Shapiros. What leaps off the pages is a story of love and profound respect and gratitude for two human beings who touched people of all stripes. It is simply unthinkable that they allegedly were bound and their Paradise Valley home set ablaze, with the Shapiros inside. A suspect has been charged with their murder and other crimes. His name is Michael Lee Crane. He is 31 years old, and declined his first chance to have the court appoint an attorney for him. 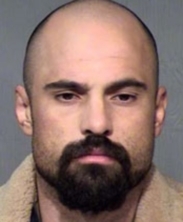 This is the Maricopa County video of his initial appearance after being charged with the murder of the Shapiros. What he said at that appearance after being advised he’d been charged with murder, armed robbery, burglary, arson of an occupied structure and kidnapping — and after he listened to an exchange between the prosecutor and the judge over the possibility that the death penalty could apply in the case — provides a glimpse into a chilling mind-set. “Do you have any questions, sir?” the judge asked, after setting cash bond at $3 million. “Umm, no — but I have a statement I’d like to make,” Crane replied. The judge advised Crane against making any statements, but he ignored the advice. “I would like to reserve my right to Uniform Commercial Code 1-207, and the Uniform Commercial Code 1-103,” he said. Here is a man charged with taking human lives and burning the bodies, and yet he spouts the Uniform Commercial Code to the judge — something fantastically incongruous in the context of the charges against him. “The Uniform Commercial Code does not apply to criminal proceedings, sir,” the judge said. It is unclear from the video whether the judge was wondering if she’d just arraigned a “sovereign citizen.” She did not utter the phrase. Read “Return of the Sovereigns” on the website of the Southern Poverty Law Center for some background on why “sovereign citizens” and the Uniform Commercial Code have become entwined.